Gold Jewellery > Gold Pendants. Item Description Cute looking Lord Ganesha pendant in pure gold and stones decoration for eternal success and good health, weighs about 2.98 gms and 91.6% in purity. 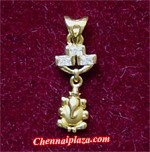 Item Description Elegant looking Lord Jesus with cross pendant in pure gold in emboss design is for eternal success and peace in life, weighs about 2.89 gms and 91.6% in purity. Item Description Awesome looking Heart designer pendant in pure gold having a heart design with rhodium polish and a single stone decoration, weighs about 3.04 gms and 91.6% in purity.